Electroreception probably evolved over 500 million yearsago and has apparently been lost and secondarily evolved in several different groups of aquatic vertebrates, including most groups of non-teleost fishes and several orders ofteleosts. Electroreception probably evolved over 500 million years ago and has apparently been lost and secondarily evolved in several different groups of aquatic vertebrates, including most groups of non-teleost fishes and several orders ofteleost’s (Collin & Whitehead 2004; Gibbs & Northcutt2004). The receptor cells responsible for detecting electricity are derived from the hair cells of the acousticolateralissystem, which is responsible for mechanoreception (vonder Emde 1998; Collin & Whitehead 2004). In a study of lateral line development in larval sturgeon (Acipenseridae),Gibbs and Northcutt (2004) suggested that the electro receptive organs arise from the same embryonic precursors as the neuromasts of the lateral line. There are two general types of electroreceptor organs in fishes. 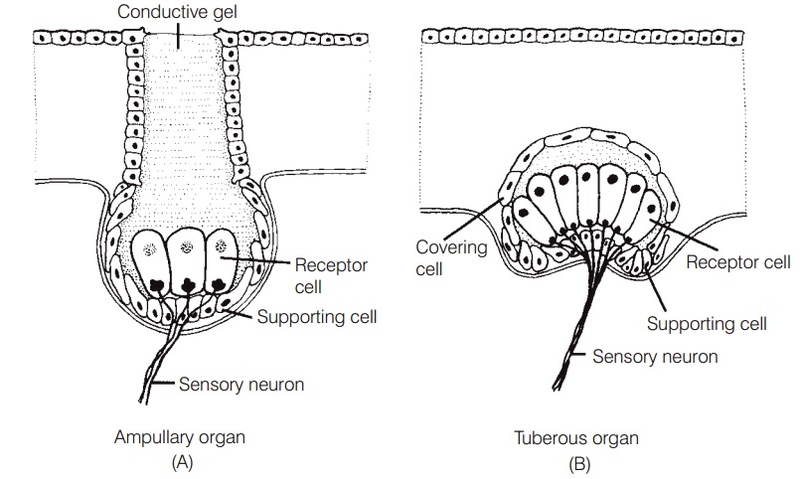 Ampullary receptors are located in recesses in the skin that are connected to the surface by a canal filled with a conductive gel (Fig.6.5A). They are sensitive to electric fields of low frequency(<0.1 to 25 Hz) and are found in many groups of fishes. Tuberous receptors are located in depressions of the epidermis, are covered with loosely packed epithelial cells(Fig. 6.5B), and detect higher frequency electric fields(50 Hz to >2 kHz). They are found in fishes that use electric organs to produce their own electric fields, and are most sensitive to the frequencies produced by the fish’s own electric organ.